With a SmartCloud Virtual Data Center there is no need to purchase or maintain complex and expensive server hardware and related equipment. The SmartCloud VDC allows you to self-provision and deploy high-availability Virtual Machines in minutes with a few simple clicks and then easily scale CPU, RAM and disk drive resources up or down as needed. The SmartCloud VDC supports all popular operating systems and software including Linux, Windows, FreeBSD, Solaris etc. SmartCloud VDC Virtual Machines offer the same levels of functionality and control as regular dedicated servers with guaranteed hardware power (CPU / RAM) and dedicated disk drive resources. 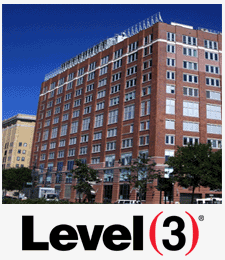 SmartCloud systems are hosted in the Level 3 data center facility at 85 10th Avenue in New York City. The SmartCloud VDC Manager interface is a brandable (your logo) multi-tier control panel system which provides the ability to manage all aspects of your Virtual Data Center including the ability to create and deploy new Virtual Machines, start, stop and destroy existing ones and scale CPU, RAM and disk drive resources up or down as needed. You can create custom server templates to deploy from or select from a number of pre-built Linux, Windows, FreeBSD and other server images. You can provide your customers and users with login access to your own branded control panel where they can access their servers by remote console (VNC/IPMI) and install or re-install the server operating system, reboot, power down or power up their servers and view graphical server bandwidth usage statistics. The SmartCloud VDC systems are a fully redundant design which incorporate integrated data replication and backup utilizing automated drive image snapshots and other comprehensive hardware layer data replication technologies. Virtual Machines can be fully restored from the latest backup within minutes if necessary, drastically reducing typical server restoration time and giving you the ability to quickly recover from any data loss. Virtual Rack Units Virtual Rack Units is similar to the rack unit measurement used in regular physical data center and colocation rack terms. One rack unit (1U) will generally accommodate a 1U rack mounted server although some higher capacity servers can take up 2U, 3U or even 4U of space in a data center rack. Virtual Machine Capacity The number of Virtual Machines which the VDC environment can support is the same as the number of rack units which the VDC has. Dedicated CPU Cores The number of CPU cores allocated to the VDC for use with Virtual Machines. Generally each Virtual Machine would be allocated with 1-2 CPU cores although Virtual Machines that are intended for supporting CPU intensive applications may require more than this. Dedicated RAM The dedicated RAM that is allocated to a VDC environment. 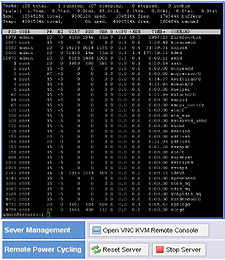 A 5u VDC for instance can support up to 5 Virtual Machines each with 1GB of dedicated RAM. Hard Disk Drives The hard disk drive capacity allocated to a VDC environment. The hard disk drives can be of any capacity and combination up to the total available hard disk space allocated to a given VDC. A 5u VDC for instance may be configured to support 5 Virtual Machines each with 300GB drives however it could also support 2 Virtual Machines with 600GB drives and another 3 with 100GB disk drives for a total of 1.5TB. Data Transfer This is the total inbound and outbound data transfer across all of the Virtual Machines supported by the VDC. Additional bandwidth can be purchased if required at the rate of $0.10 per Gigabyte. IP Addresses The number of usable IP addresses allocated to a VDC. Additional IP's can be allocated at any time at the rate of $2.50 per IP per month. 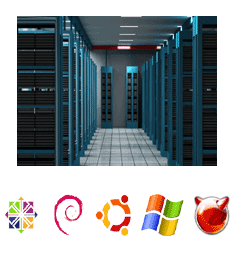 Operating Systems The VDC supports all common server and desktop operating systems including Linux, Windows 2003 / 2008, FreeBSD, Solaris, Windows XP, Windows 7 etc. Full Data Backup Full daily backups of all the Virtual Machines supported in your VDC are included as part of the service at no additional charge. 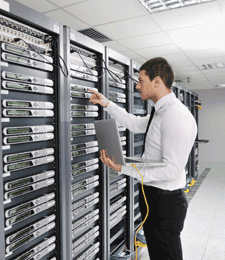 24/7/365 Expert Support Smart Servers handles all issues related to the network and server hardware aspect of the VDC service including the monitoring of critical systems associated with your VDC. Our technical support will respond and deal with any hardware or network related issues within a 30 minute time frame as per the provisions outlined in our 100% Uptime SLA.